Multimode Patch Cable Assemblies made of the finest quality materials. Color coded connectors for convenience. 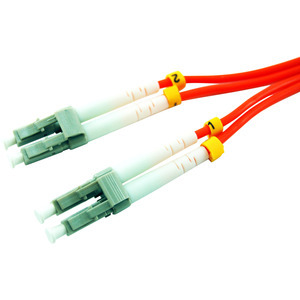 LC/LC Duplex 62.5/125 Multimode Fiber Patch Cable - Orange 62.5/125 micron cable for fast ethernet, fibre channel, Infiniband, ATM and gigabit ethernet applications that require high speed data transfer. Each cable is 100% optically inspected and tested for insertion loss.